L-arginine contributes to muscle growth because it is needed for the synthesis of most proteins. While the muscle mass increases, L-arginine also signals muscle cells, encourages the release of growth hormone and promotes fat metabolism. 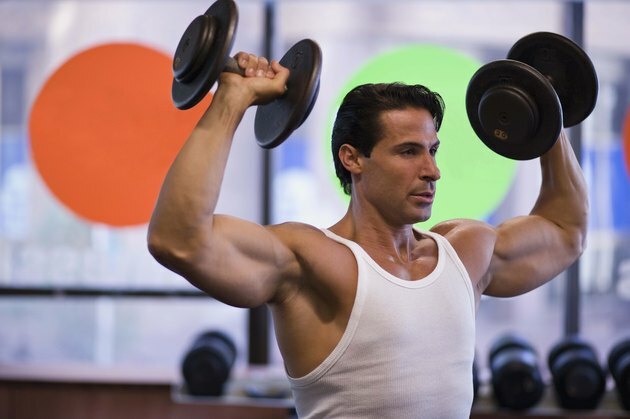 The overall result is the well-toned, lean muscle mass sought by bodybuilders. By reducing the fat stores underneath the skin and promoting muscle growth, L-arginine can increase your fitness and improve strength, which are needed for bodybuilding. Increased strength through building muscle mass is not the only benefit of L-arginine for bodybuilding. By serving as a precursor for the vasodilator, nitric oxide, L-arginine promotes endurance and muscle conditioning. When nitric oxide is released, it widens the blood vessels by relaxing the muscles of their walls. This lowers blood pressure and increases blood flow to the muscles during workouts. The increased blood flow means that oxygen and nutrients are adequately supplied to your muscles and for longer amounts of time. This can help reduce muscle damage, promote healing and provide peak performance. L-arginine helps maintain overall health by boosting the immune system. It mops up free radicals and increases the effectiveness of the cells of the immune system. Since bodybuilding takes you through repeated physical stress and increases the chances of infections and muscle damage, it is important to ensure that the immune system is always bolstered. There is no standard L-arginine dosage for bodybuilding, but a range of 2 to 30 g daily is accepted. However, to reduce the occurrence of side effects such as nausea, diarrhea and weakness, you should start with a low dose of 3 to 5 g daily, taken before and after your workouts. After the first week, you increase the dosage to a point where the benefits are maximized and the side effects are reduced. L-arginine supplements should also be taken in cycles by discontinuing the regimen after two months and resuming it after another two months.